As an Italian Renaissance art lover, art preservation and restoration have always been important to me. So it feels like somewhat of a contradiction that I gravitate in my own work towards impermanent materials. The found and recycled materials that I use are fun to gather and to work with, but they don’t last, and they resist preservation. Each work grows, stays, decays – integral parts of a cycle which the photograph shows at its heights, marking the moment when the work is most alive. There is intensity about a work at its peak that I hope is expressed in the image. Process and decay are implicit. The photograph. Photography has allowed the marriage of the ephemeral and the permanent. If we are lucky enough to be there at the time, we can see the work at its peak. If not, we can love a beautiful photograph instead. We have to let it go, but its beauty remains. A reminder to value the moment. In an older post, I included a video of Tibetan monks creating a sand mandala, which they destroyed when finished as a nod to life’s impermanence. It would be very special to see that process in person! But we were fortunate that it was captured on video. Here then are more mandalas created from ephemeral materials. The photos remind us that nothing is permanent. 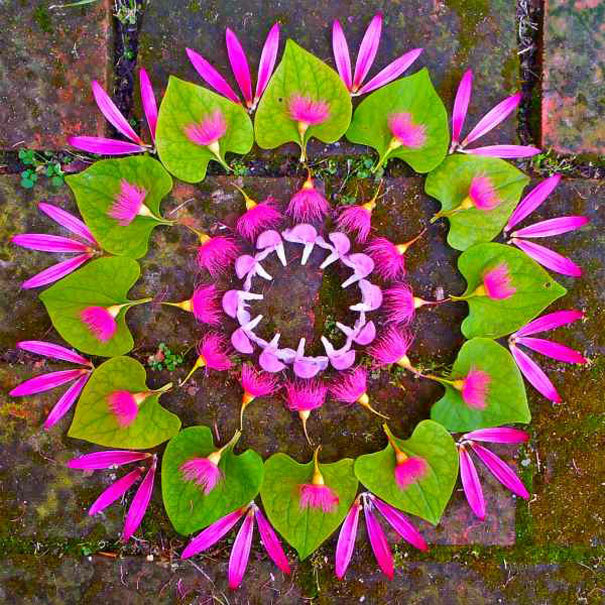 Kathy Klein creates exquisite mandalas from flowers and other natural elements. Here are a few examples, but there are hundreds more, each one more beautiful than the last. You can view them all at dānmālā.com. 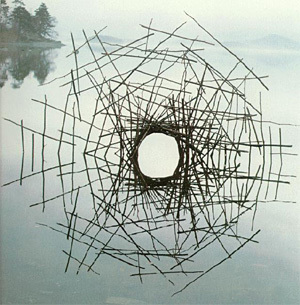 Here’s a beach mandala made from seaweed, artist(s) unknown, waiting to be swallowed by the tide. Simon Beck, a snow artist from Savoie, France, created these mandalas by plodding through the snow on snowshoes. Each piece takes 5 to 9 hours to complete and is about the size of three soccer fields. His works are quickly covered by new snowstorms. 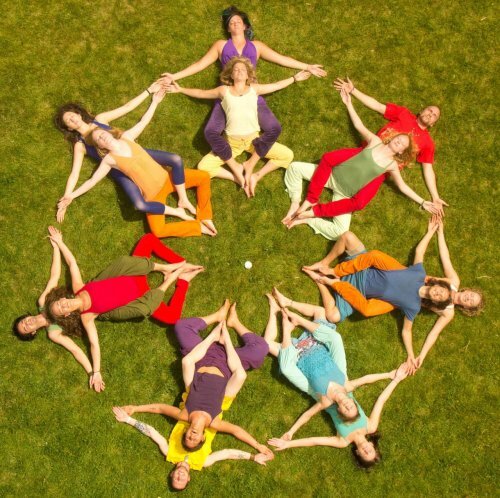 And finally, I love these collaborative yoga pose mandalas from the folks at The Human Mandala Project. This entry was posted in ephemeral art, mandala on January 21, 2014 by Helen Ellis.